When I grew up we had a Gardener tending the grounds twice a week. As in when you get punched in the solar plexus – winded. 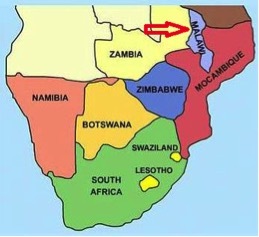 Heaven alone knows what he had to endure to get to South Africa. Winded had the greenest of green fingers and made our garden into a mini Eden! I had a brief commercial venture with Winded … but it ended badly! I financed the purchase of kitchen wall clocks, which he took back on a visit home to sell for an exorbitant markup because kitchen clocks were in short supply in Lilongwe (capital of Malawi). He returned a few months later with no clocks and no share of the profits. I honestly couldn’t understand his English so his explanation was unintelligible to me. I just felt so bad for him having to endure such a life that I let it go. Needless to say, my gardening mentor (if I could be so bold as to call him that) did leave upon me the desire to make my own garden bloom – albeit under North American skies. However, I must admit that that project is still very much a WIP – work in progress. But I am trying; one of my strongest qualities is persistence. So I will persist, and as Malcolm Gladwell says, accumulate my 10,000 hours of gardening to enter the ninja world of Gardeners like my friend Winded … wherever he may be. Since I need constant motivation, I watch YouTube videos on gardening. One of my favorites for inspiration is this documentary on BBC Two - Don’t the Brits just make the best documentaries? Check out Around the World in 80 Gardens Episode 8 South Africa – it’s a solid hour of natural gardens zzzzzzzz Ha Ha!! We plant the seeds, water, and light and give it TIME to grow (compound). Sometimes we need to take precautionary steps, such as treating the lawn before weeds show up. In that vein we shall now explore whether we should be taking any precautionary steps in our investment garden? Albeit for a few brief days of volatility in 2015, the market has really gone nowhere material since all the way back to November 2014. The SPY (S&P 500 tracker etf) has been trading in a tight range between 202 and 212. Which way will it ultimately break? It is clear that some sort of top is in the making. So we need to ask ourselves - will we look like fools if the markets were to fall 20% and we failed to recognize this as a top? Like a detective let’s see if we can discern any (macro) clues as to what will cause such a correction in the US markets. 1. Our view on China is well documented in this piece – Shanghai Stock Exchange Index and the Long Game which we published February 2nd 2015. Essentially, we said the economics and stock prices were diverging and that the central government was likely pumping up stock prices in an effort to overcome a real estate crash. We note this chart in John Mauldin’s Thoughts from the Frontline – July 10th 2015. 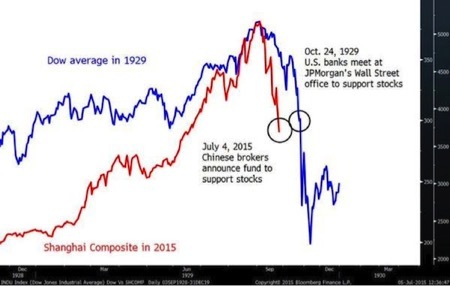 It traces the recent performance of the Shanghai Composite versus the Dow Industrials in the 1920s. This is a typical ‘crash’ pattern and can be witnessed in all markets that have undergone a mania such as the Nasdaq in the 1990s and Japan in the 1980s. The message is more pain to come for Chinese Stocks which (if current correlations remain in force) means additional pain for emerging markets, commodities and PERHAPS a spillover effect on developed markets such as the US. 2. Our position on Europe was detailed in this article on January 26th 2015 – Padding the Runway benefits European equity markets. Europe (and Greece) is not a capitalist system and other ‘non-profit’ motives would trump the day. Hence our conclusion was that problems in Greece (and Spain and Portugal and Italy) would be kicked down the road in a never-ending extend and pretend cycle with the ultimate goal of ensuring the European Union remains intact. Given that Tsipras ultimately agreed to terms that were less advantageous to those initially proposed before he brought his country to the Brink of economic suicide – we conclude that the Germans are willing to sacrifice Greece and allow it to leave the Union. A position we didn’t think was tenable a few months ago. The Economist of 23rd May 2015 reports that UK CPI was down -0.1% than a year earlier, the first time since 1960 and essentially deflation. That’s all the cover the ECB will need to continue their stimulus program with vigor … so we don’t anticipate further crisis coming out of Europe for the foreseeable future. 3. That leaves The Fed and the prospect of Rising Rates as a potential correction culprit –perhaps in our view as the most credible. However the Fed will ultimately hike interest rates which will have significant consequences as Larry Fink of BlackRock et al. have exclaimed. Firstly, the Corporate Investment Grade Bond market has ballooned $3.7 trillion over last decade. This massive increase in issuance is concentrated in hands of mutual funds, foreigners and insurance companies. Wall Street banks have retreated due to post-crisis regulation. Increasing the risk free rate will have negative consequences on this debt mound, and it is likely fixed income managers are loading up on treasuries which they can sell easily if a rate hike causes a flood of redemptions and a market panic. Secondly, we wonder if the global economy is strong enough to sustain a higher risk free rate? In a torrent of economic data, the latest is the quarterly indicator of labor costs called the employment cost index (ECI). The ECI rose only 0.2 percent in the second quarter (the smallest in 33-years), which is far below expectations ranging from +0.5% to +0.9%. Wages just aren’t growing. As my friends at Dix Hills Partners say, take a look at the last rate rising cycle as an analog. As presented in Figure 4, the Fed began its last rate rising campaign in July 2004, ending in July 2006 (blue line). The 10 year rate moved steadily LOWER during this period until the very end of the rate hikes when it moved north of 5.5%. 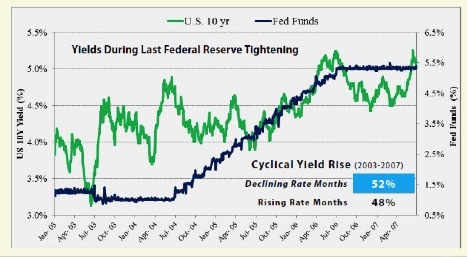 If this were to repeat in some form, we would have a flattening yield curve which is usually an indicator of slower growth which will have negative consequences for equity markets as well as credit markets. Is it just us? Or are others wondering if the global economy is weak as a RESULT of trillions of Dollars in stimulus, as opposed to the constant drumbeat of “we need to stimulate in order to create growth”? The pushing on a string analogy. The term Green Fingers refers to a person’s ability to grow plants --- not unlike the ability to grow a portfolio. No Human knows the markets path from here, but we would advise that it is prudent to plan for some STORMS because probabilities may have shifted towards Risk as opposed to Return. Thank you for reading my post. I regularly write about private market opportunities and trends. If you would like to read my regular posts feel free to also connect on LinkedIn, Twitter or via Atlanta Capital Group. Advisory Services offered through Atlanta Capital Group. Securities offered through Triad Advisors, Member FINRA / SIPC.